Nearly 400 oreum, or cone-shaped protrusions created hundreds of thousands of years ago by small volcanic explosions around the base of Mt. Hallasan, dot the island of Jejudo for as far as the eye can see. This otherworldly landscape is a hiker’s paradise, a stunning combination of lines, shapes and lush greenery that draws hundreds, if not thousands, of men and women, boys and girls, grandmothers and grandfathers to trek across these peculiar formations each and every day. Among them are photographers, looking for that perfect picture. Yongnuni Oreum, or “Dragon Eyes” Hill, is one of Jejudo’s most famous oreum. 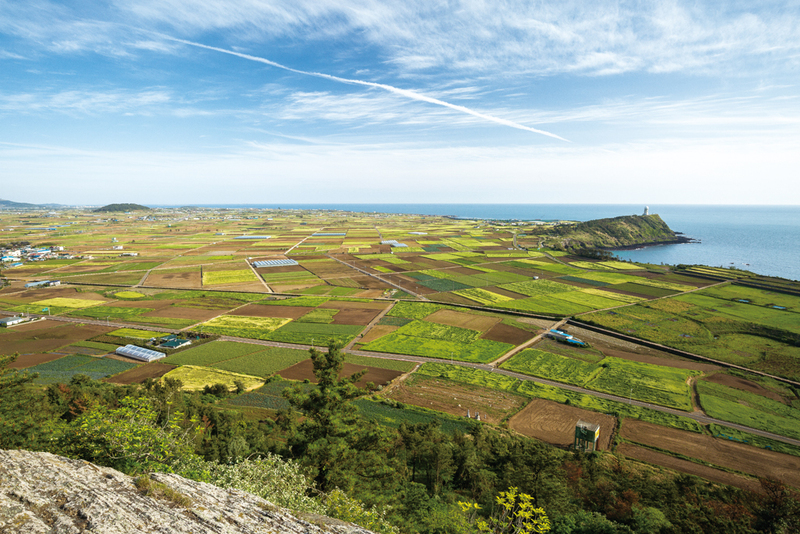 Located on the northeastern end of the island, the slope sits right in the heart of farmland bursting with some of the best-looking oreum Jejudo has to offer. 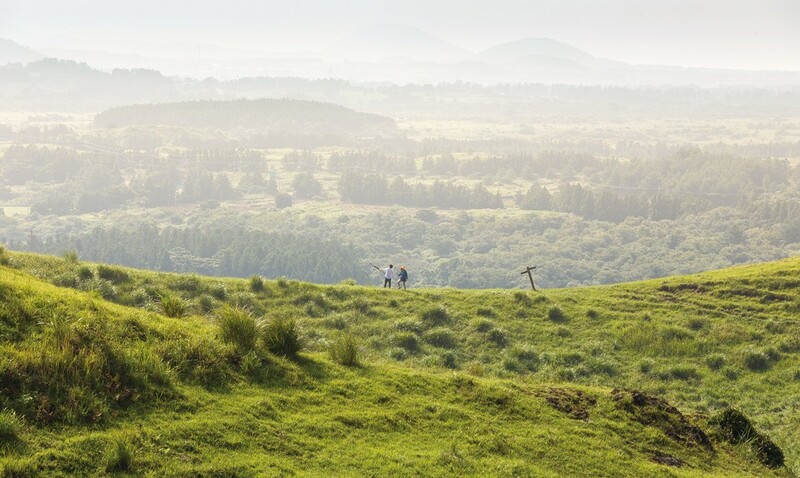 On a sunny summer day the vibrant green hills appear to come alive as sunlight shines down on them and soft breezes push their lush grasses back and forth across the landscape. Weather conditions can change rapidly, however, as I learned while making my way up the steep, winding trail on a recent trip, enshrouded in thick fog and buffeted by harsh winds. Fortunately, I’ve learned to be patient, and on that day my wait was short. By early afternoon, the sky had cleared slightly and rays of light spread across the hill as hikers walked up and down the many trails. Within an hour, though, storm clouds had rolled in and the light disappeared just as fast as it had appeared. Dejected, I began my descent, my picture taking done for the day. Just then, a young boy flew past me, his father nipping at his heels. In the distance, layers of hills and dark, angry clouds clashed for space – all the elements of a great photo came together in a brief moment. It was a photo opportunity years in the making. I first arrived on Jejudo in January, 2002. Excited by the fact that I was now living in what many have dubbed the “Hawaii of Asia,” I spent months traveling around the island and taking in all the popular tourist destinations. What I did not realize in those early years, however, is how inaccessible the island’s oreum can be to newcomers. The discovery of such innocuous wonders left me seeing the terrain in an entirely different light. There is a sense of natural sprawl and randomness to oreum that makes them difficult to photograph. It’s not until one begins to move into the right spots, pursue the best angles and meld the natural elements of light, wind and color together that one can see the deeper beauty of these famous Jejudo landmarks. Having had some interaction with the communities that thrive in these areas, I can say that the local people’s connection to the land is equally moving. 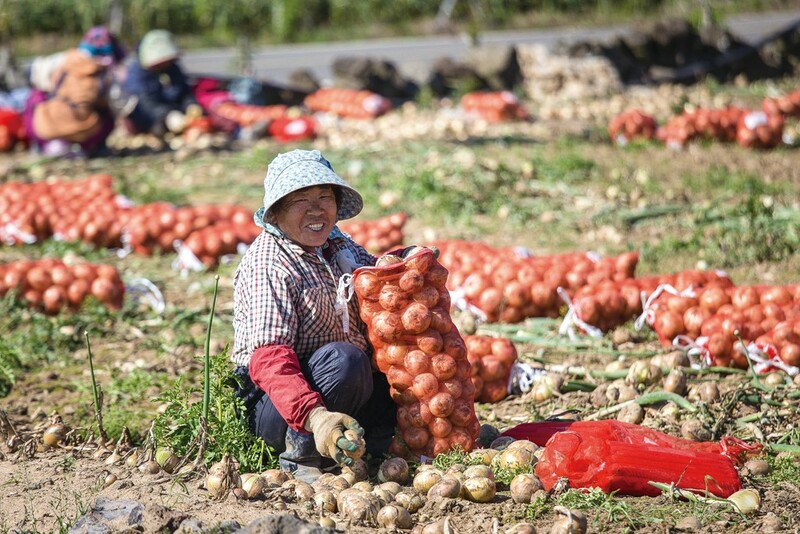 On a recent trip to Dangsanbong Al Oreum on the west coast of the island, I spotted a group of older women dressed in colorful work clothes putting onions into bags in a nearby field. Intrigued, I hopped out of my car and entered the field to watch the women at work. Their arms and legs were covered in dirt. They wore thick gloves to protect their hands from cuts and scrapes. Their faces were covered in sweat and grime. Despite what looked to be backbreaking labor, one older woman flashed me a huge grin. When I asked her why she was so happy she cheerfully exclaimed, “This is my home. I was born here. These are all my friends. We enjoy coming out to the fields together, working hard, harvesting the land and sharing stories.” I could feel their sense of community and closeness to the terrain. Heeding a farmer’s advice later that day, I sat perched on the southwestern corner of Dangsanbong Al Oreum’s peak and watched as the sun set over the famous Chagwido Island. My position afforded me an even more striking view down below, however. The fields of garlic, onion and barley formed an endless patchwork of puzzle-like squares that extended for miles into the distance. Just a few minutes west of Yongnuni Oreum lies one of Jejudo’s most beautiful hills: Darangshi Oreum. Its near-perfect triangular shape looms like a pyramid over the pristine rural landscape. Arriving a little early one day, I took some time to explore nearby Aggeumdarangshi Oreum. The donut-shaped “Little Darangshi” features a solitary tree at the top and a crater filled with tall, bristly stalks of grass. It’s a study in simplicity. As I take in the panoramic views of Seongsan Ilchulbong in the south and the oddly hat-shaped Songi Oreum in the west, I’m struck by a man half-hidden in the grass praying to relatives lost over a half century before. Sasam, or “4.3,” broke out on Jejudo on April 3, 1948. 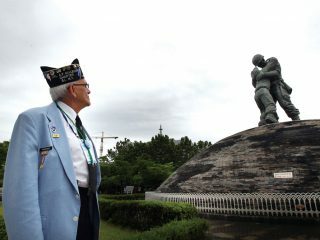 One of the deadliest conflicts in Korean history, it continued for six bloody years, during which time thousands of Jejudo residents died, mostly at the hands of security forces, as punishment for perceived sympathy toward communism and the newly formed North Korea. Darangshi’s dark history was in the back of my mind as I trekked up the steep trail to the summit. Overall, I’ve come to appreciate Jejudo as a place of maddening contrasts and inconsistencies, of beauty and sadness and both mystery and openness that I’ll never fully comprehend. At the top I’m greeted by one of the best views in all of Jejudo. A gallery of oreum stand proudly in the distance, stretching across the landscape below like some kind of massive exhibition. The sun began to set and golden light streamed across the 115-meter-deep crater just beyond my feet. As I steadied my camera on a tripod, a father and teenage son stepped into the sun’s glare and walked hand-in-hand along the crater’s rim. 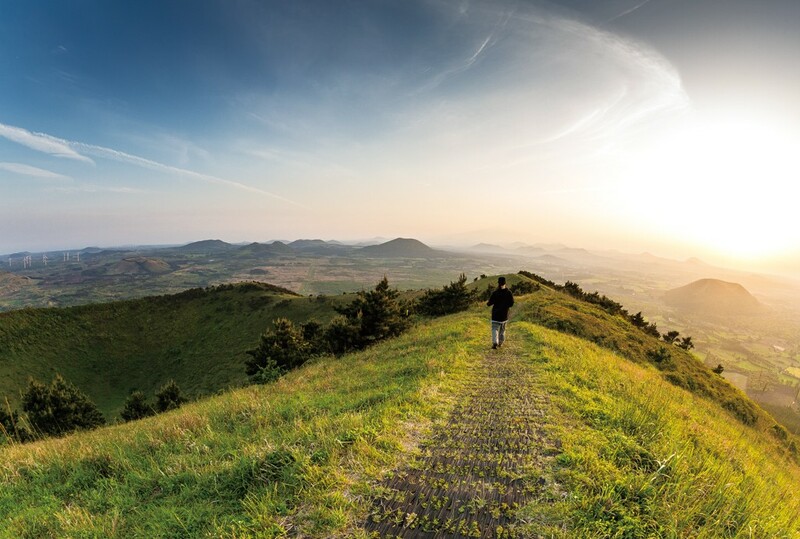 FYI> Jeju Air, Jin Air and T’way offer several daily flights to Jejudo from Gimpo International Airport. SEE> To get to the Yongnuni and Darangshi Oreums, first take bus No. 100 from Jeju International Airport to Namseogwang Village. From there, take bus No. 710 to the Gasinamdong Ipgu stop. If you hike straight ahead from the stop, about 2 km, you’ll come to Yongnuni Oreum. Head left for 1.8 km and you’ll reach the Darangshi Oreum. To get to Dangsanbong Al Oreum, first take bus No. 38 from Jeju International Airport to Wollang Ipgu. From there, take bus No. 702 to Gosan 1-ri. The oreum is a short walk from the stop. STAY> The well-reviewed December Jeju Hotel (T. 064-745-7800) is a 10-minute drive from Jeju International Airport. Rates start at KRW 65,000. If you want to stay closer to the action, Sundeogi Byeoljang Pension (T. 064-782-1860/010-4404-1860) is located within biking distance of several oreum in rural Songdang-ri. Rooms are definitely upscale and rates vary from KRW 80,000 off-season and mid-week to KRW 150,000+ during peak times. 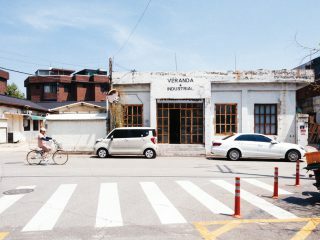 Seongsan, home to famous Seongsan Ilchulbong, is just a 30-minute drive from the Yongnuni and Darangshi Oreums and offers several places to stay and eat at various price points. Sumbi Guesthouse (T. 070-8147-1818) is a good value, with dormitory rooms costing KRW 15,000 and four-person rooms being KRW 50,000. The guesthouse offers oreum tours every Saturday. Options are limited around Dangsanbong Al Oreum, but Sanbangsan Hot Springs (T. 064-792-8300) is a cheap and fun alternative that is only 20 km away, nestled in a dramatic location under Mt. Sanbangsang. For KRW 11,000 you can soak in the hot springs after a long day of hiking. EAT> Sujane restaurant is a two-minute walk west (near the ocean) along the road in front of Dangsanbong Al Oreum. The food is outstanding, offering abalone soup (KRW 13,000), spicy seafood noodle soup (KRW 8,000) and a variety of seafood dishes that start at KRW 20,000. Famous seafood restaurant Badaui Jip (T. 064-784-8882) in downtown Seongsan is a 30-minute drive from Yongnuni Oreum. Menu items include delicious local delicacies such as abalone soup (KRW 10,000), seafood hot pot (KRW 12,000) and urchin bibimbap (KRW 15,000).